Depending on your locale, the world outside may not exactly be full of colorful life but with spring right around the corner, we’re inspired by the knowledge it soon will be! This spring’s color palette is inspired by blossoming flowers, swimming pools, and gentle skies. 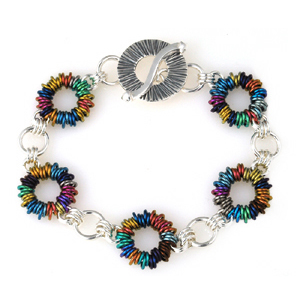 These luminescent colors are best found in our enameled copper, anodized niobium, and glass rings. 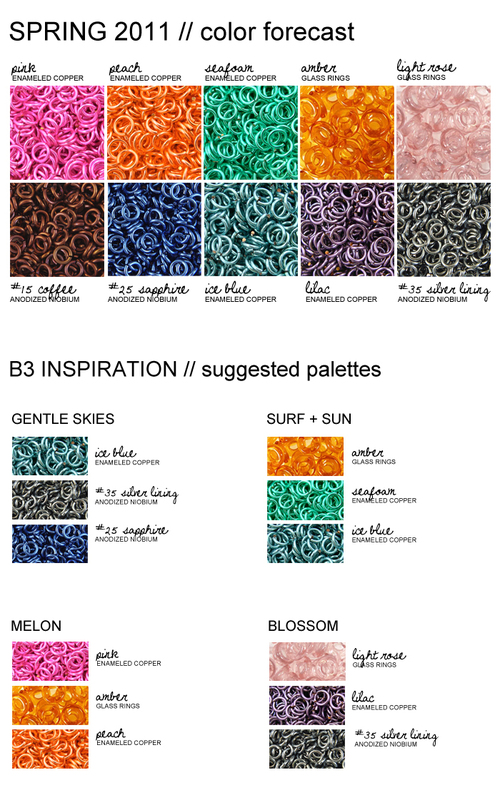 Consider trying out this palette with one of our new artist-designed kits that use these rings to create weaves that are reminiscent of spring flowers. 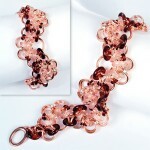 This delightful bracelet uses Rebeca’s signature technique of “coiling,” which mimics the look of coiled wire by stringing tiny jump rings onto larger rings. A simple technique, but the possibilities are endless! A little off-kilter, staggered and definitely akimbo. This intermediate level pattern feels like a warm sunrise with rays of complimenting color. March is National Craft Month! What better time feel the creative spark and tackle that project you’ve been dreaming of? 1 Comment on "Spring 2011 Color Forecast"
LOVE the new colors. Can’t wait to try them.